So you decide you want drapery panels and walk in your room to think it over. You have an idea, and you sit down to pick out your drapery fabric. Oh no, which one do you choose? Let me share with you a couple of things to consider as you make your decision. 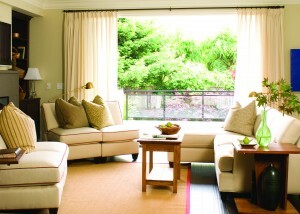 Drapery fabrics should be one of the first things you consider when starting your redecorating project. Because they are such a large element in the room, drapery can direct and change the whole styling of your space. The style of drapery panels will go hand-in-hand with a fabric selection. For instance, if your room receives large quantities of sunlight, then you will want to select a thicker fabric that will help to insulate. But if your window is beautiful and viewing the outdoors all the time is crucial, then you might want to consider lightweight fabrics — or even a transparent one. 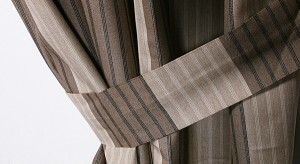 Solid colors are one of the simplest selections when trying to choose a drapery fabric. I recommend keeping your fabric color a couple of shades darker or lighter than your wall color. Keeping this rule in mind, your result will be unified and it will provide you an uncomplicated result. A patterned drapery fabric will give you the biggest impact overall. Large patterns grant a clear direction for the style of your room. You can really gain the “WOW” factor. It will probably be best to use this pattern as your inspiration point. If you like patterns but you don’t feel good about a “screaming” pattern, select a medium- to small-patterned fabric. If you much prefer a normal “voice”, a smaller-scale pattern will work flawlessly into a much larger plan. Vertical stripes will help to raise the ceiling of a room and provide an overall height boost. In contrast, horizontal stripes can help to widen the look of a room. Another splendid feature about stripes as drapery fabric is that a room design can be pulled together with the right color combination of stripes. Unusual or specialty fabrics can create a style that is absolutely stunning. Hand-painted fabrics, crewel linens, metallic-glazed fabrics and three-dimensional fabrics are just naming a few. Even though these fabrics will absolutely be worth every bit of your investment, you have to keep in mind that the fabric will probably be more costly to purchase by the yard, and drapery will be more costly to construct. 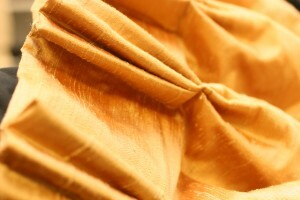 If your heart flutters when you see a drapery fabric, then don’t end up regretting passing on a fabric that you love. The last point I want to mention is a practical element. When selecting fabrics, always bear in mind the actual weight of the drapery fabric makes a difference on how the panels hang. For example, if you want a functioning drapery treatment and your heart is set on velvet, you will struggle to regularly open and close it. Another element that is effected by weight is how it hangs to the floor. A lighter-weight fabric with “body” to it will drape perfectly to the floor. Softer, loose-woven fabrics have a tendency to stretch with time and lose their shape. Also, a heavier-weight drapery fabric requires substantial hardware support. 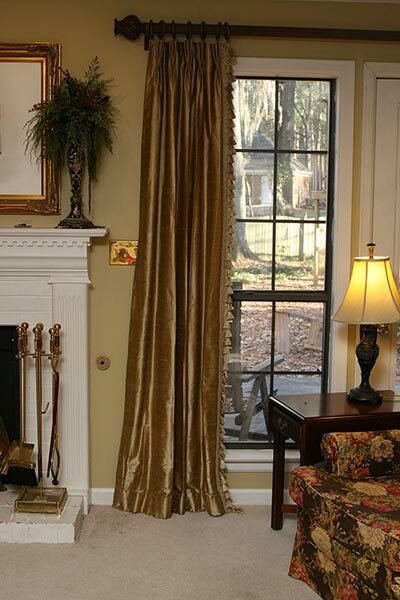 The above-mentioned elements should be considered carefully when making your decision on drapery fabric. The most important thing you can ever do in the decision process is hold the fabric in your hand. Being able to use all of your senses to connect with a fabric will allow you to evaluate if the fabric speaks to your heart. As long as you select a fabric you love, you will never tire of looking at it.